Ten years ago today Jodrell Bank was much busier than usual on Christmas Day. Artist’s impression of Beagle-2 on Mars (all rights reserved Beagle-2). Just before 3am on Christmas morning 2003, the British Beagle-2 spacecraft was due to land on Mars. Conceived by Professor Colin Pillinger’s team at the Open University, working with the University of Leicester and industrial/academic partners, Beagle-2 had been carried to Mars by the European Space Agency’s Mars Express. The lander was packed with innovative scientific equipment designed to search for evidence of past or present life on Mars. Designed and built in the era of Brit-pop, its call sign was composed by the band Blur and the test-card to calibrate its imaging devices was painted by Damien Hirst. 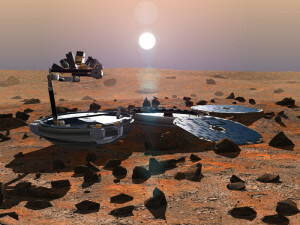 After landing, Beagle-2 was scheduled to contact NASA’s orbiting Mars Odyssey spacecraft at around 05:00 on 2003 Dec 25. Following its first Martian night, it would “wake up” later on Christmas Day and at 10:20pm begin sending a slow “Morse Code” style 10 seconds on, 50 seconds off signal back to Earth. These signals were designed to be picked up by the Lovell Telescope at Jodrell Bank. Our engineers had built a special radio receiver using superconducting filters supplied by the University of Birmingham. These filters were designed to reject any nearby interference whilst transmitting almost all the signal in the 4 MHz wide band around a central frequency of 401.6 MHz. Like all our receivers, it was cooled to about 260 degrees below zero Celsius, thirteen degrees above absolute zero, in order to reduce electronic noise. The signals were sampled at high-speed and fed into a PC called “fitzroy” (named after the Captain of the original Beagle which carried Charles Darwin on his voyage of discovery). The data were then Fourier transformed and displayed as real-time spectra in a waterfall plot of time versus frequency with signal strength represented as a colour scale. The great advantage of a waterfall plot is that weak signals appearing at around the same strength as the background noise but at a particular frequency in the spectrum can be picked out by the human eye (particularly good at spotting patterns in noise). The Beagle-2 signal was planned to be significantly above the noise level and its on-off profile would have stood out as a vertical dashed line, perhaps drifting slowly sideways due to warming of the transmitter and/or the Doppler shift due to changing relative velocity between the lander and the telescope. A signal from a spare Beagle-2 transmitter brought to Jodrell Bank was used to test the system. 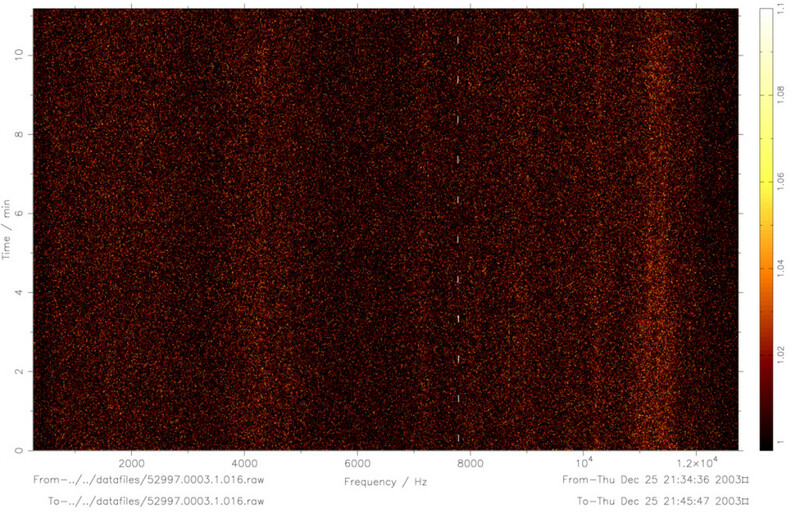 This waterfall plot shows a “dashed” test signal injected into the data and similar to that expected from Beagle-2. Although transmissions from Beagle-2 were not scheduled to begin until 22:20, the landing site appeared over the limb of Mars at about 18:00 as viewed from Jodrell Bank. Since it was unclear whether the lander would be operating to specification, we began observations at about 17:00 and continued right through until Mars set below our horizon just after midnight. The position of the Beagle-2 landing site on Mars as viewed from Jodrell Bank on the evening of 2003 Dec 25 (created using Starry Night). It’s unusual to do astronomy observations where you expect to receive a signal at a specified time, so as we counted down the tension in the Lovell Observing Room was high. The scene in the Lovell Observing Room as we waited for Beagle-2 signals to appear. Unfortunately, as is well known, no signal appeared on our screens. We already knew something was wrong as Odyssey had failed to receive its own signal earlier that morning but we’d still been hoping that something might appear. Following that first non-detection, I edited the analysis software to fold the recorded data and further improve the signal to noise but still there was nothing. 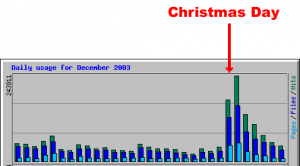 There were two further scheduled communication windows starting 23:00 on Boxing Day and 22:56 on Dec 27. 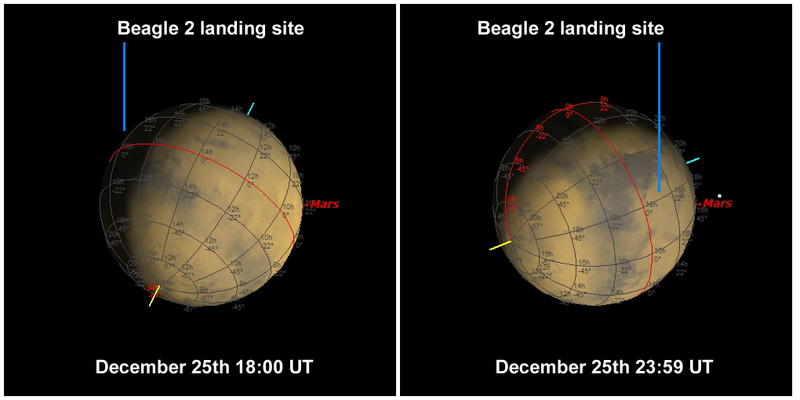 Since one possibility was that the clock had failed and the transmissions were not happening at the scheduled time, on Boxing Day we observed from 17:45 when the landing site appeared around the limb of Mars, and then on Dec 27we began observing as soon as Mars rose at around 13:00 and continued until it set below the western horizon. This was repeated on Dec 28. After that time, the landing site was on the far side of Mars whilst Mars was above our horizon. Meanwhile the OU/Leicester Beagle-2 team were attempting to hail/command the transmitters on the lander via Odyssey and Mars Express. 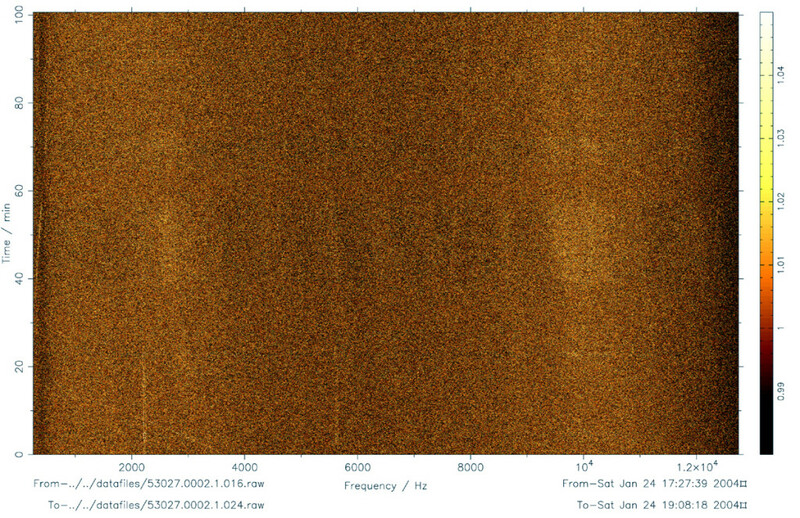 Following a period of radio silence from 12th to 22nd January designed to trigger Beagle 2 into a pre-set transmission state, a final set of observations were made from Jodrell Bank on January 23-25. There was still no signal and it was sadly concluded that the landing had failed. A non-detection from Jan 24. You can see weak radio interference as drifting vertical lines in the noise. 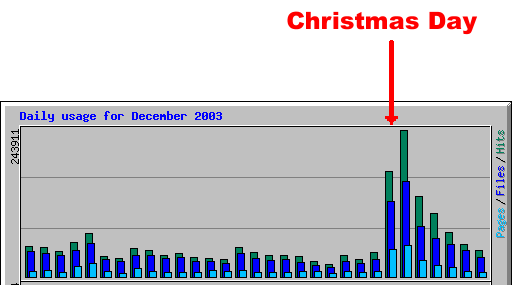 This graph shows how the number of visits to Jodrell Bank’s website shot up over the Beagle-2 period. Beagle-2 demonstrated the strong public interest in space exploration. 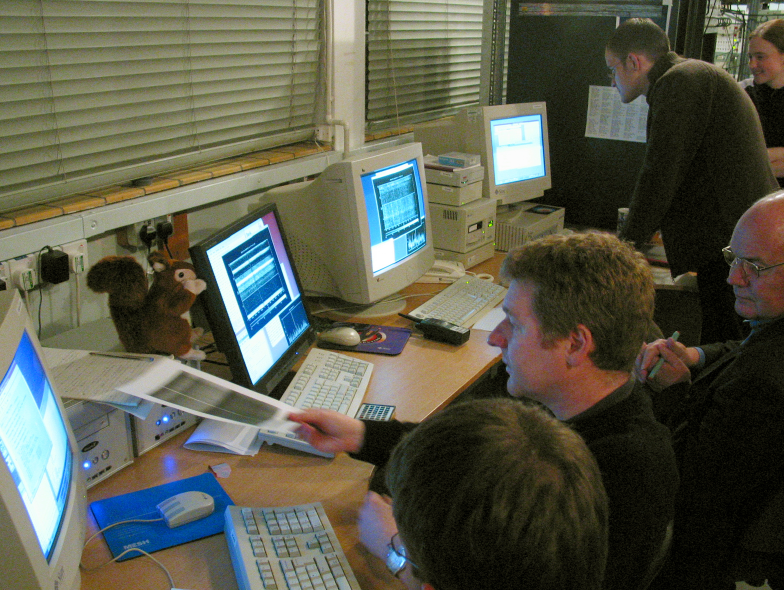 The media were clamouring to be at Jodrell whilst the observations were happening and our web server was swamped with people looking for updates. Despite the failure of this particular lander, the last ten years have seen several other successful Mars missions. Two others (NASA’s Maven and India’s MOM) are on their way there now and more are planned for the future. It even seems likely that humans, not robots, will explore the surface of Mars in our lifetimes. So much had to go right in sequence. Hopefully, will hear you on BBC R5 (again), after any announcements.